کاتب, فاطمه, عادلوند, پدیده. (1393). پنجره، عنصر اصیل منظر؛ زیبایی‌شناسی پنجره در نگارگری دوره صفوی. 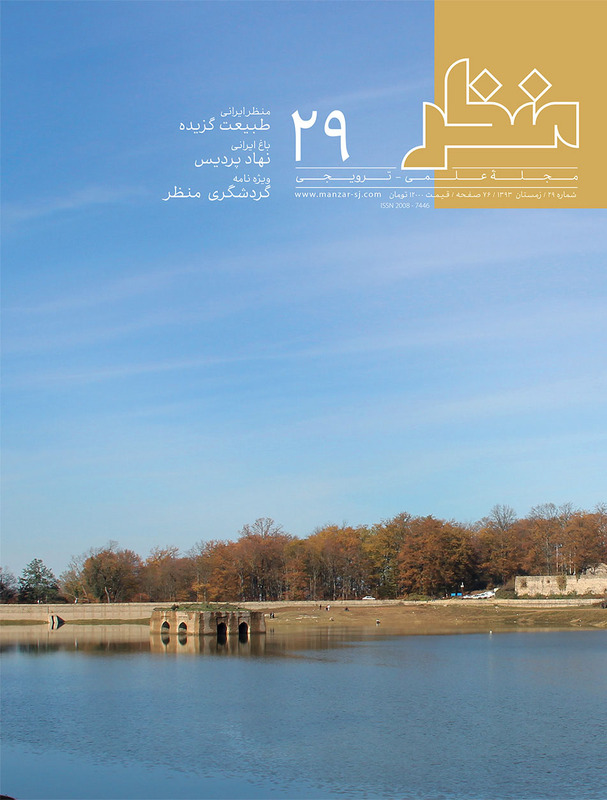 مجله علمی-ترویجی منظر, 6(29), 12-19. فاطمه کاتب; پدیده عادلوند. "پنجره، عنصر اصیل منظر؛ زیبایی‌شناسی پنجره در نگارگری دوره صفوی". مجله علمی-ترویجی منظر, 6, 29, 1393, 12-19. کاتب, فاطمه, عادلوند, پدیده. (1393). 'پنجره، عنصر اصیل منظر؛ زیبایی‌شناسی پنجره در نگارگری دوره صفوی', مجله علمی-ترویجی منظر, 6(29), pp. 12-19. کاتب, فاطمه, عادلوند, پدیده. پنجره، عنصر اصیل منظر؛ زیبایی‌شناسی پنجره در نگارگری دوره صفوی. مجله علمی-ترویجی منظر, 1393; 6(29): 12-19.
miniature is one of the traditional arts which follow the features of its own speech. Many researchers from one hand with different perspectives often followed by traditionalism and mystical approaches, study the ultra facts of this art and on the other hand, other researchers due to the lack of artifacts remained by the past eras in various fields such as architecture, gardening, urbanism, art and culture have turned to this art and realized the stylistic features of each of these areas by reading them out. Based on the literature and architecture history of Iran, “window”, as a functional element has had a strong presence from the beginning of “residence” in the ancient Islamic architecture, as it has been responsible for the lighting and ventilation of air to the inside of the buildings. During the Safavid era, window as a webbed mesh item provides a way of seeing without being seen. This new item allowed the women of the Safavid period, to participate in ceremonies and have their own observation without impairing their privacy and composure despite the prohibition of their direct participation in the ceremonies, festivals and other events that, was well consistent with the principles of confidentiality of Iranian culture. By reading through the painting artworks of Safavid era as the turning point of the miniature painting of Iran, window is beyond a mere physical element that is responsible simply for lighting task, hereupon due to the presence of human interaction with the environment, it is converted to an landscape element; accordingly the artist painter, exploit intelligently the window for emplacement of characters and a way of interact between the indoor and outdoor environment. This article upon the presuming of “window” as a landscape element, claims that its aesthetic aspect is also pursue three goals of “function”, “aesthetic” and “identity” in addition to the landscape objectives. The miniature painter illustrates the functional aspect of window by using the white color for interior space of it to convey lighting concept and also through emplacement of the characters inside the framework manifests the interaction with the environment. The principle of confidentiality and hierarchies as a matter of culture and faith in land of Iran, with the element of window and its lattice design and curtains which were common in the Safavid period, are also observed in the painting miniatures; for that reason, the majority of women in the painting artworks are portrayed in the window frame in line with the concept of providing comfort and safety for them while participating in ceremonies and events. The aesthetic aspect of window is fulfilled through decoration, which the principles of traditional arts especially miniature painting; decoration especially the geometric ones in window frames implies the importance of it to the painter. According to the miniature painting of Safavid era, it can be said that the picturesque of window in this era was quite comply with the landscape-oriented aesthetic aspects. In other words, the tradition of Iranian-Islamic architecture of this era has been a landscape based convention that employing of the three elements of beautification including function, identity and aesthetic confirms the claim.